The extra heavy platforms from sustainably sourced wood make the Natural Paradise Cat Tree xL - Premium Edition very secure and stable and you can rest aΒured in the knowledge that the wood comes from an environmentally friendly source. The generous platforms are perfect for bigger cats that will enjoy their own private retreat. There is also a den covered with wooden slats where your cat can while away the time in supreme comfort. Extra-wide sisal-covered posts with a 15cm diameter allow your cat ample space to stretch and sharpen its claws. The soft, quilted platform covers as well as the two high-edged snuggle beds are firmly attached to the wood platforms with velcro so that they stay in place even during the wildest games. They can be easily removed when they need to be washed. Even the largest hammock can be quickly taken off the wooden frame and washed at 30 degrees;C. The elegant Natural Paradise Cat Tree xL - Premium Edition offers five different places for your cat to relax, watch, and nap. To keep things lively and exciting it also features three little toys with bells. 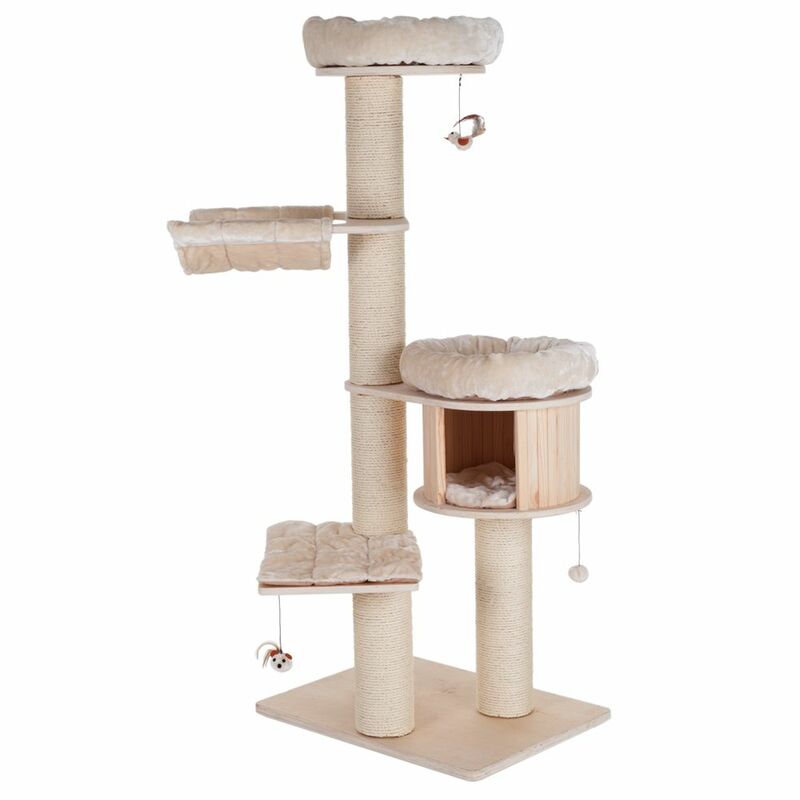 The Natural Paradise Cat Tree - xL Premium at a glance: Extra StableThe large base plate is made from untreated natural wood and offers added stability for the cat tree. Large Sisal PostsExtra thick 15cm sisal posts offer plenty of opportunities for scratching, sharpening and daily claw care. Sustainable MaterialThe large real wood base is made from untreated wood from sustainable forestry. It can be easily wiped clean with a damp cloth. Easy CleaningPadding and cushions can be easily removed and washed at 30 degrees;C. They are fastened to the base plate with Velcro fasteners, to prevent them from sliding around. Removable HammockThe large hammock can also be easily removed from the wooden frame and washed at 30 degrees;C.
Very stable scratching post with xL sized platforms Perfect for bigger cats Solid natural wood (untreated) platforms from sustainable sources: ensure that this scratch post is extremely stable All wood comes from sustainable forests: ecologically friendly Very thick sisal-covered posts: provide your cat with ample space to stretch and sharpen its claws Spacious platforms: 5 levels with open and closed retreats Removable cushions that are washable at 30 degrees;C (100% Polyester): make cleaning the platforms much easier and make taking care of your scratch post a breeze Cushions have soft filling: to guarantee your pet the utmost comfort Natural colours, easy to care for Made in Georgia Colour: Available in cream, black, brown or burgundy red Total dimensions: 75 x 56 x 175 cm (L x W x H) Base: 75 x 56 cm (L x W) Platform with removable pillows: Platform: 55 x 38 cm (L x W) Velcro fixings Den with slatted wood: Total dimensions: diameter approx. 45cm, height 28cm Inner: diameter approx. 38cm, height 25cm With removable cushions 2 snuggle beds with cushions: Total dimensions: diameter approx. 47cm, height 11cm Lying spaces: diameter approx. 33cm Velcro fixings Hammock..